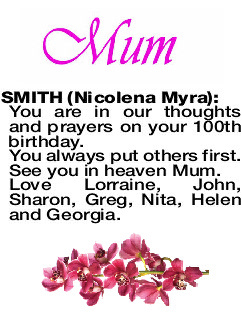 SMITH NICOLENA MYRA You are in our thoughts and prayers on your 100th birthday. You always put others first. See you in heaven Mum. Love Lorraine, John, Sharon, Greg, Nita, Helen and Georgia.